Villa Lucrezia, a late 19th century building, consists of four elegant apartments and a courtyard where the guests can safely park their car. Villa Lucrezia offers four elegantly furnished apartments of 60 m², each apartment consists of a bedroom with king size bed, bathroom and living room with kitchenette and double sofa bed. 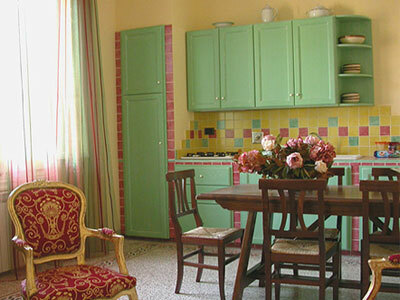 Villa Lucrezia is located in Florence, in the residential area Porta al Prato. A quiet zone approximately 100 meters from the "Parco delle Cascine", the "city's lungs". The historical city centre can easily be reached by bus. Villa Lucrezia is the ideal starting point for your visit to the historical centre of Florence, where you can admire museums, churches, historical locations and all the other marvels of this city so rich on history. Close by you can find bars and restaurants, as well as the bus stop where you can take the bus to the historical centre of Florence.